This is one way to connect the softer suction hose of 2 inch and the plastic pipe which is exactly the same size as the suction hose. 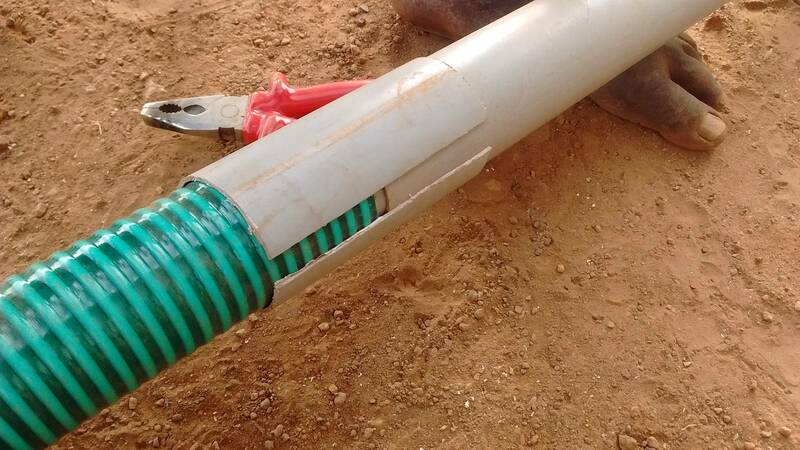 The suction cannot be put directly onto this plastic pipe as how we have done that in Tanzania. The pipe is simple of different type over here. We have cut two pieces of the plastic pipe and then cut it on one side of the pipe, along the side. One piece have been bent and made smaller, expandable due to its elasticity and placed it inside the suction hose and the plastic pipe. Another piece have been placed on top of the two. Both are serving as connectors. The water pressure is high and such connecting would not be enough in itself. Thus it has to be tied with the rubber string when in use. The rubber string will make sure that no water is leaking and that both the suction hose and the plastic pipe are tied strongly together.